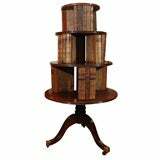 A fantastic and fun oak revolving bookcase, made in England, circa 1870. This bookcase was made by S & H Jewell, a quality, family-owned cabinet making company from west central London. The antique bookcase was made using solid quarter sawn oak. The thinly ripped quarter sawn oak vertical slats give the antique a look that was ahead of its time. Its incredible lines could have been an inspiration for Frank Lloyd Wright and those involved in the Arts & Crafts style. Each of its four sides have three shelves for arranging all of your favorite books. The bookcase revolves while the cruciform base remains in place. revolving Georgian mahogany bookcase with 19th leather bound book binds attached, all original. A good quality and of great proportions, 19th century English bookcase/ display cabinet in bleached oak. England, circa 1880.